Do you need to lose weight, but are too busy to prepare nutritionally-correct low-calorie meals? Here's the good news: You can do-it-yourself for less! A lot less. All you have to do is pick the right frozen meals, and supplement with the right vegetables, fruit, and dairy (or dairy substitute) and you'll have DIY Nutrisystem and DIY Jenny! Exactly the same? No, but close enough to get the similar results. All you need is a microwave oven and a trip to your supermarket. Let's begin by choosing the right frozen meals for lunch and dinner. Let's start with calorie limits. There are lots of low calorie frozen meals that are not only delicious but filling as well. Many (but not all) frozen entrees from Lean Cuisine, Healthy Choice, Weight Watchers Smart Ones, and "Eating Right For Healthy Living" (the Albertson's/Safeway/Vons brand) qualify as good places to start looking. Using coupons and sales, you can often buy these for as little as $2.00 to $2.50 a piece. Even some Michelina's meals (some but not most) are okay, and they're a buck a piece in most supermarkets! Got a Little More Cash? Many (though not all) of the frozen meals from Evol, Luvo, Kashi, Safron Road, Amy’s Light and Lean, and Kashi are also wonderful choices for healthy weight loss, though plan on spending between $3.25 - $5.25. I suggest living within your budget, and sprucing up your lower priced meals with some of the higher end meals when they're on sale. The supermarkets are always rotating their promotional sales. Buy the more expensive options only when you can save big (which happily is quite often). Choose a Variety, so You Won't Get Bored. Try to favor the meals that have more vegetables and/or higher fiber, but the occasional single serving pizza is fine (under 450 calories). Make sure that every meal you buy is SINGLE SERVING only. Check the label closely, as sometimes a frozen meal label will say "contains 2 servings." Check the nutrition label on the box for sodium content. Keep it under 650mg per meal, the lower the better. If you have high blood pressure or other medical conditions, consult your physician first, before starting any weight loss plan, whether an organized company program, or a self-directed effort. Okay, let's move on to fruits and vegetables that you must add for healthy nutrition. The average American eats 1 fruit serving and 2 (non-potato) vegetable servings per day. They should be getting more than double that for optimum nutrition. Dairy: Go for 2 servings. Don't buy frozen breakfasts as 90% are nutritional disaster areas. You're better off with oatmeal, a low sugar high-fiber cereal, or a Thomas' High Fiber English muffin topped with a tablespoon of non-fat cream cheese or fruit preserves (must say "no sugar added" on the label). To complete your breakfast, you should add a fruit serving and a dairy serving such as a cup (8 oz.) of low fat milk (1% or skim). Almond Milk and some other calcium enriched dairy substitutes will also work. 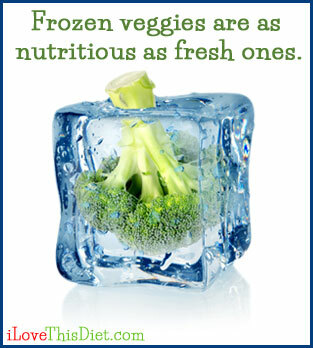 Frozen fruits and vegetables often have better nutritional content than the “fresh” produce at the supermarket! This is because frozen vegetables and fruits are picked and frozen at their nutritional peak, whereas the “fresh” produce has to be picked before they fully ripen, so that they can be transported often hundreds or thousands of miles before being warehoused, and then sent to your supermarket. Nutrients are lost in the transit time. Fruits and some vegetables contains some sugar and sodium naturally, but check the ingredient list on the package to make sure that the manufacturer isn't adding more. Many frozen fruit bars are delicious and under 100 calories. Dreyers makes a great line of frozen fruit bars in a variety of flavors. Portion control is the key when it comes to dessert. Make sure that you only buy treats that are individually wrapped as single servings. Vitalicious makes some incredible 100 calorie muffins, "muffin-tops" and brownies that you’ll find in the frozen food section of many higher end supermarkets. Even Walmart sometimes carries one or two of their products. In addition to truly great taste (especially the chocolate varieties), Vitalicious products all have very high fiber content to keep you feeling full. If your supermarket doesn’t carry them, you can order them directly from Vitalicious.com. For lower priced options that are in most supermarkets (not in the frozen food section), try brownies from Fiber One. Most people find them very tasty, and they have fiber to ward off hunger. A lesser way to go (but still okay) are the 100 calorie packs of cookies, chips, or pretzels. They are nutritionally worthless, and won't keep you from getting hungry, BUT, they're only 100 calories and may satisfy a craving. Nutritionally bankrupt snacks are okay once per day if they're less than 100 calories each and individually-wrapped. I can't stress enough how important it is to only buy snacks that are individually wrapped per serving. Never buy a big bag of potato chips or cookies! Don't buy any ice cream that isn't in single-serving portions. Don't do it! You will regret it! Today is the Day to Take Action! If you find yourself pushed for time, frozen foods may be the right way for you to lose weight. Go for it! Of course, if cooking is your passion, then this plan won't suit you at all. Don't worry - I pro mise you that there is a path to weight loss that will work for you. Andrea Morganstein is a Registered Dietitian, with an MS in Nutrition. She specializes in weight loss, for both adults and children.